Cockles, also known by their scientific name Cardiidae, are heart-shaped, bivalve sea creatures that are cooked and eaten for their high protein content. This species is the largest of the bivalves and is distinctive due to its symmetrical shell. Cockles are low in fat and carbohydrates, so they can be suitable for a variety of diet plans. 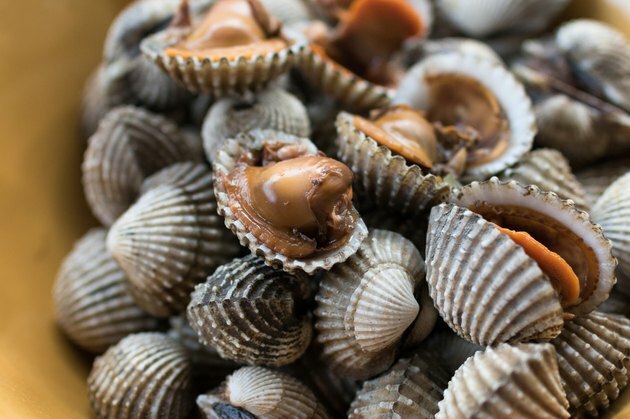 Cockles are low in calories, with 79 calories in an 100-gram serving. This amount is less than 4 percent of the average intake of 2,000 calories and is lower in calories than other types of seafood, such as tilapia, which contains 128 calories in an 100 g serving. Cockles can be a good choice if you are trying to lose weight, as it would take just 16 minutes of water aerobics or 9 minutes of swimming laps to burn off the calories in 100 g of cockles. Cockles are rich in protein, with 13.5 grams in each 100-gram serving. Consuming protein is vital for your health, as it provides the structure for your body's cells and tissues. The Institute of Medicine recommends that women eat at least 46 grams of protein a day, and men should consume at least 55 grams. While protein can enhance your muscle gains, it may also be helpful for weight loss; research from the August 2008 issue of "The British Journal of Nutrition" indicates that high-protein diets can increase your rate of weight loss and help you maintain strength during dieting. Cockles, as with many other types of seafood, are low in carbohydrates. Each serving of cockles provides 4.7 grams of carbohydrates, with no fiber and no sugar. Carbohydrates supply your body with energy for exercise, so if you are a competitive athlete, you may wish to eat a carbohydrate-rich side dish along with cockles. Cockles are low in fat, with just 0.7 grams in each 100-gram serving. None of the fat in cockles is saturated fat, a type of fat that may increase your risk of heart disease. Some fat is beneficial for your health, as it helps your body absorb nutrients and can supply energy for extended exercise bouts. How Many Calories Are in Baked Tilapia?